I use Microsoft’s Live Writer to create my posts for this Blog. One of the things I ran in to recently was that I wanted to edit a previous post, I’d found a broken link in the post. However, the post in question didn’t appear in the Open recent post’ list. This list looks to be restricted to ten (10) entries. As it turns out Live Writer is pretty good in allowing you to edit previous posts, it’s just not to obvious how to do it. I found a this post on Technogran’s tittle tattle. The details are actually in one of the comments made. It’s a comment made by technogran1 on November 27, 2010.
rather than have you have to click on a link and scroll down to find the steps I’ve included them below, along with some screen shots. Click on the top left hand side File icon. From the drop down list, move the mouse on to ‘Open recent post’ to highlight it then click onto the words ‘Open recent post’. If you don’t click ‘Open recent post’ you’ll only see the 10 most recent posts. Another window will then open. If you have more than one Blog account then select the account you’re looking to use. 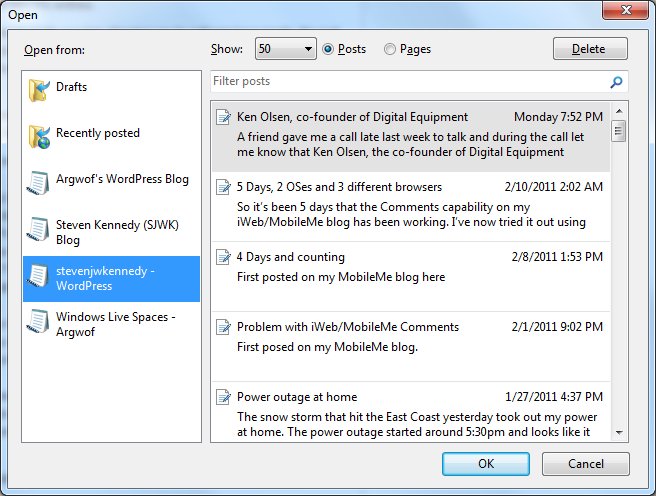 You’ll see a dialog box open and Live Writer will connect to the blog and retrieve the previous posts and then display them to you. At the top of ‘Open’ window, you will see in the middle a drop down to ‘Show’ how many Posts or Pages to display. Change this to as many posts as you wish to go back to in order to edit them. In most cases you can get Live Writer to now fetch up to 3.000 posts. Scroll down the list of posts that are now shown from your blog until you reach the one that you wish to edit. Highlight it by simply clicking on the post in question, (it will turn blue) and then click on OK. The post will then be shown in the compose and edit window. Change it but do NOT alter the ‘Set post date’ at all if you want that post to be retained in its old position. NOT!. 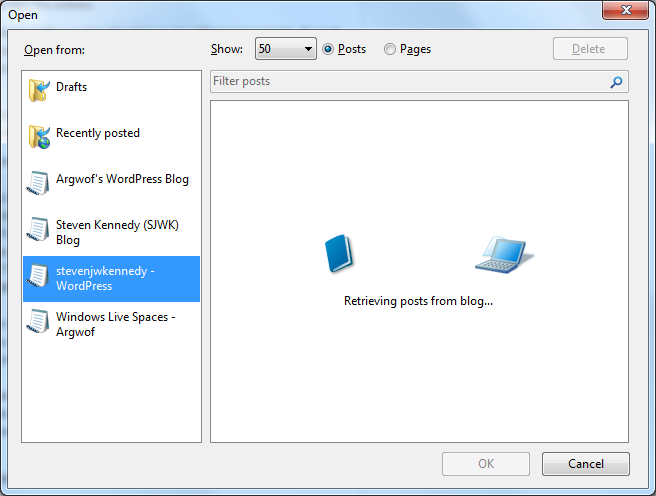 You can also edit pages as well as posts in Live Writer on WordPress. One thing I’ve come across that makes Word ‘better’ than Live Writer is the use of Bookmarks. You can Bookmark places in your post and create links to them. You cannot do this, at least I haven’t found a way, in Live Writer. I have found that you can use Word to create a post using Bookmarks and links and then use Copy & Paste to paste the post in to Live Writer. Which would then raise the $64,000 why would you. Why not just use Word to write and publish the post.